Amy X Neuburg – vocals (1, 2, 6, 9, 10 & 13). As anticipated in my previous post, here is my third review in a row of an album released in 2010 by MoonJune Records – and, like its predecessors, definitely one of the top releases of the year. 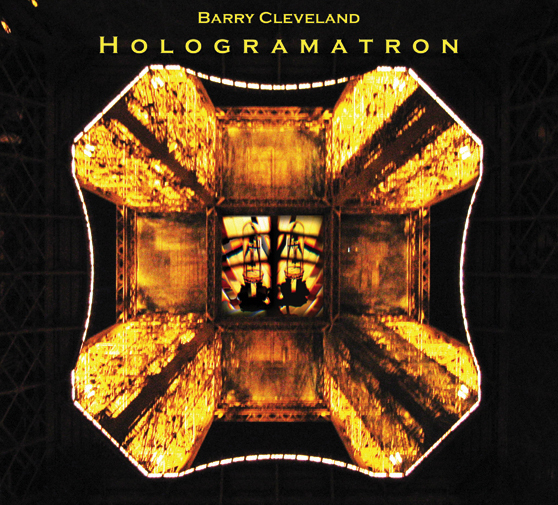 Hologramatron, the fifth album credited to the name of San Francisco-based guitarist, composer and journalist Barry Cleveland (currently Associate Editor for Guitar Player magazine), has recently been submitted for the Grammy Award as “Best Alternative Rock Album of 2010” – and deservedly so. A labour of love, whose recording took several years to complete, Hologramatron (whose title, according to the artist himself, means ‘whatever you need it to mean’) is one of those rare musical efforts that manage to sound like very little else. With derivative acts a dime a dozen on the current music scene, listening to such an album can be an exhilarating experience. Although Barry Cleveland’s name may be the most prominent on the cover, unlike your average ‘solo pilot’ release this is very much a collective effort, in which the input of each member of the band is recognizable, yet at the same time meshes with the others to form an organic whole. Unabashedly eclectic, Hologramatron has been called a modern ‘protest album’, and with very good reason – though only part of the songs have an unmistakable socio-political bent. However, it is first and foremost a collection of inspired, thought-provoking compositions performed by a group of amazingly talented, experienced musicians who manage to come across as an extremely tight unit rather than a combination of over-inflated egos. While vocalist Amy X Neuburg (a classically-trained singer, and a truly serendipitous find for Cleveland) may be relatively unknown outside dedicated avant-garde circles – in spite of an impressive curriculum as a composer and ‘avant-cabaret’ artist – the name of bassist Michael Manring is nothing short of legendary among four-string fans, and both drummer Celso Alberti and pedal-steel guitarist Robert Powell can claim a number of prestigious affiliations. When such collective talent is gathered together, the results may often be a tad underwhelming – especially when musicians forget that they are at the service of the music, and not the other way round. Thankfully, this is not the case with Hologramatron. The impressive cohesion between all the artists involved, band members and guests, results in 10 tracks that display a remarkably original approach, even when external influences can be detected . While listening to the album for the first time, the closest comparison that came into my mind was with the late ‘90s – early 2000’s incarnation of King Crimson – and Robert Fripp is undoubtedly one of Barry Cleveland’s most noticeable sources of inspiration. In contrast with the majority of prog albums released in the past year or so, Hologramatron is based on relatively short compositions, none longer than 6 minutes – and, indeed, half of the tracks are songs with a more or less ‘conventional’ verse-chorus-verse structure. The album might even be seen as a lesson on how to produce music that does not rely on 30-minute epics or convoluted concept stories in order to be progressive. As I previously pointed out, eclecticism is the name of the game, with the hard-hitting earnestness of tracks like “Lake of Fire” or “Money Speaks” relieved by the inclusion of two covers of Sixties hit songs (which, in my personal view, do not really fit too well with the rest of the album), or the gentle yet emotional content of “Stars of Sayulita”. The psychedelic-meets-ambient component of Cleveland’s creativity (which was brilliantly showcased in the band’s live performance at ProgDay 2010) is here represented by the instrumental tracks, namely “You’ll Just Have to See It to Believe It” and “Abandoned Mines” – where Cleveland’s array of traditional and electronic guitars, effectively supported by Robert Powell’s pedal-steel guitar, Manring’s stellar bass and understated percussion patterns, weave subtly entrancing, multilayered textures. On opener “Lake of Fire” (whose firebrand lyrics point a sharp finger at Christian fundamentalism), Amy X Neuburg adopts two sharply different singing styles in the verse and the chorus – soothing, almost seductive in the former, venomously aggressive in the latter. The splendidly bass-driven “Money Talks” and the haunting “Stars of Sayulita”, graced by the warm, bluesy vocals of Harry Manx and Deborah Holland, follow a similar ‘mainstream’ pattern – as, obviously, do the two covers, “What Have They Done to the Rain” and “Telstar”, whose cheerful nature contrasts almost jarringly with the rest. Two of the tracks with vocals, however, diverge quite sharply: the ominous, electronics-laden avant-rap of the aptly-titled “Warning” (with vocals courtesy of long-time Cleveland collaborator Michael Masley, aka Artist General), and the tense “Suicide Train” (interpreted by Cleveland himself), an effort that borders on metal, featuring a beautiful, hypnotic guitar solo bolstered by crashing drums. Running at around 64 minutes, Hologramatron is nowhere as cumbersome as many other current releases, though the three bonus tracks tagged at its end do not really add a lot (unless you happen to be a staunch completist) – with the possible exception of the remix of “Abandoned Mines” (nearly three minutes longer than the original), which possesses an eerily cinematic quality. A masterful blend of mainstream sensibilities, socially-aware lyrics, intriguing atmospheres and stunning instrumental and vocal performances, this is a unique album that is warmly recommended to progressive music fans. I’ll check it out at some point, sounds good. Thanks for featuring it. This is a very well-written, well-thought-out review. Your opinions are on an even keel with the music, itself: quite articulate and elegantly-stated! Thank you, John, I really appreciate your kind words! ..I met my compatriot Celso Alberti ( drums)..it was exciting! It was indeed! ProgDay 2010 was an incredible overall experience, and I can’t wait for next year’s edition. This time I hope we’ll get to meet in person!